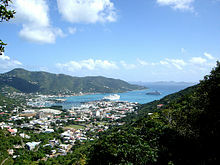 ^ "Four of VI's historical buildings get due recognition", Virgin Islands News Online, 10 March 2011. ^ CIA. Economy: British Virgin Islands 互联网档案馆的存檔，存档日期2007-04-11.. The World Factbook, CIA publications, 19 December. 2006. Retrieved 25 December. 2006. ^ Penn, Dexter J.A. Music of the British Virgin Islands: Fungi 互联网档案馆的存檔，存档日期2007-02-10.. Retrieved 25 December 2006.